Sydney Leroux scored twice and FC Kansas City hung on to beat the Washington Spirit 3-2 in front of 1,728 fans at Children’s Mercy Victory Field in Kansas City, Missouri. It was the first NWSL start for Spirit forward Mallory Pugh, who made her NWSL debut last week. Spirit midfielder Kristie Mewis opened the scoring in the 4th minute, but Leroux answered five minutes later, tying the match 1-1. Leroux added another goal in the 27th minute after forward Shea Groom forced a turnover from the Spirit defense at the top of the penalty box. Leroux picked up the loose ball and bent it past Spirit goalkeeper Stephanie Labbé to make it 2-1. FCKC made it 3-1 thanks to defender Becky Sauerbrunn, who headed home a Brittany Ratcliffe corner kick for just her third ever NWSL goal. Midfielder Alexa Newfield received her second yellow of the game in the 70th minute following a hard foul on Labbé, so FC Kansas City played the remaining 20 minutes of the match with ten players. Midfielder Havana Solaun pulled the Spirit to within a goal with a score in the 83rd minute, off an assist from forward Francisca Ordega, but Washington could not find the tying goal. Match ends, FC Kansas City 3, Washington Spirit 2. Second Half ends, FC Kansas City 3, Washington Spirit 2. Attempt missed. Kristie Mewis (Washington Spirit) left footed shot from outside the box is too high. Assisted by Mallory Pugh. Attempt missed. Havana Solaun (Washington Spirit) header from the centre of the box misses to the right. Assisted by Estelle Johnson. Attempt saved. Francisca Ordega (Washington Spirit) header from the centre of the box is saved in the centre of the goal. Corner, Washington Spirit. Conceded by Sydney Leroux. Becky Sauerbrunn (FC Kansas City) wins a free kick in the defensive half. Brittany Taylor (FC Kansas City) is shown the yellow card. Francisca Ordega (Washington Spirit) is shown the yellow card. Corner, FC Kansas City. Conceded by Meggie Dougherty Howard. Goal! FC Kansas City 3, Washington Spirit 2. Havana Solaun (Washington Spirit) right footed shot from outside the box to the centre of the goal. Assisted by Francisca Ordega. Attempt blocked. 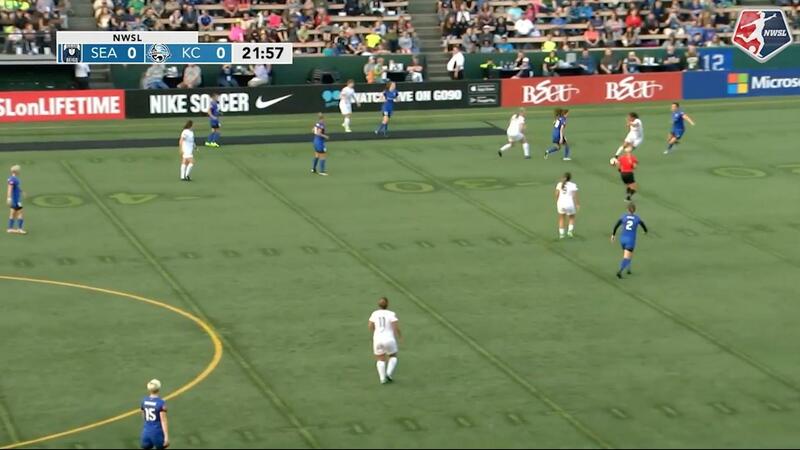 Sydney Leroux (FC Kansas City) right footed shot from outside the box is blocked. Substitution, FC Kansas City. Christina Gibbons replaces Shea Groom. Substitution, Washington Spirit. Arielle Ship replaces Katie Stengel. Attempt missed. Sydney Leroux (FC Kansas City) right footed shot from outside the box is high and wide to the right. Assisted by Katie Bowen. Offside, Washington Spirit. Kristie Mewis tries a through ball, but Francisca Ordega is caught offside. Attempt blocked. Kristie Mewis (Washington Spirit) left footed shot from the left side of the box is blocked. Assisted by Havana Solaun. Second yellow card to Alexa Newfield (FC Kansas City) for a bad foul. Delay in match Stephanie Labbé (Washington Spirit) because of an injury. Stephanie Labbé (Washington Spirit) wins a free kick in the defensive half. Attempt blocked. Mallory Pugh (Washington Spirit) right footed shot from outside the box is blocked. Assisted by Havana Solaun. Substitution, Washington Spirit. Havana Solaun replaces Line Jensen. Substitution, FC Kansas City. Katie Bowen replaces Brittany Ratcliffe. Brittany Ratcliffe (FC Kansas City) wins a free kick in the defensive half. Goal! FC Kansas City 3, Washington Spirit 1. Becky Sauerbrunn (FC Kansas City) header from the centre of the box to the top left corner. Assisted by Alexa Newfield with a cross following a corner. Corner, FC Kansas City. Conceded by Shelina Zadorsky. Attempt blocked. Brittany Ratcliffe (FC Kansas City) left footed shot from a difficult angle on the left is blocked. Assisted by Alexa Newfield. Attempt missed. 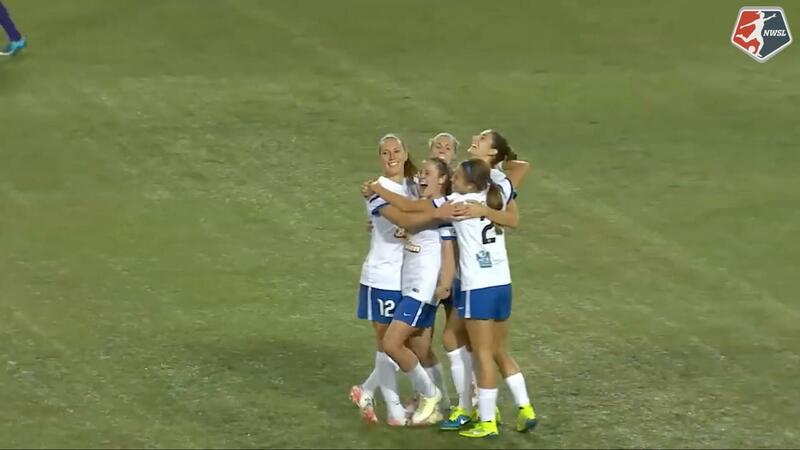 Sydney Leroux (FC Kansas City) right footed shot from outside the box misses to the right. Assisted by Brittany Ratcliffe. Delay in match Becky Sauerbrunn (FC Kansas City) because of an injury. Foul by Sydney Leroux (FC Kansas City). Attempt blocked. Yael Averbuch (FC Kansas City) right footed shot from outside the box is blocked. Alexa Newfield (FC Kansas City) wins a free kick in the attacking half. Second Half begins FC Kansas City 2, Washington Spirit 1. First Half ends, FC Kansas City 2, Washington Spirit 1. Katie Stengel (Washington Spirit) wins a free kick on the right wing. Attempt blocked. Mallory Pugh (Washington Spirit) right footed shot from outside the box is blocked. 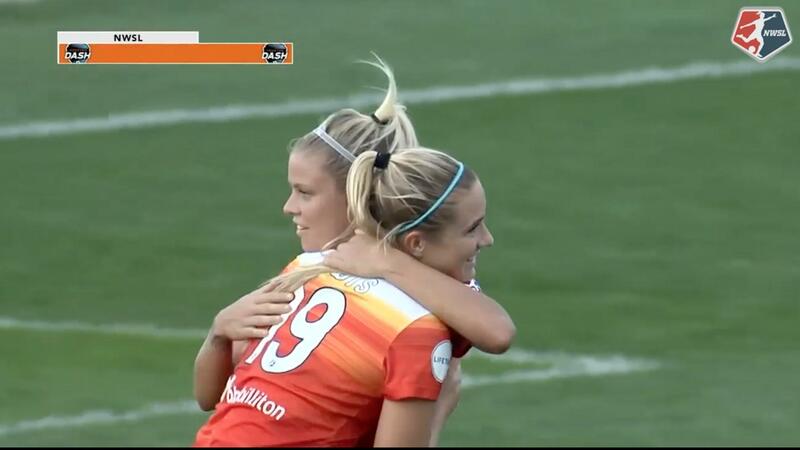 Assisted by Kristie Mewis. Foul by Brittany Taylor (FC Kansas City). Attempt missed. Shea Groom (FC Kansas City) right footed shot from the right side of the box is close, but misses to the right. Assisted by Lo'eau LaBonta. Attempt missed. Kristie Mewis (Washington Spirit) header from the centre of the box is just a bit too high. Assisted by Katie Stengel. Meggie Dougherty Howard (Washington Spirit) is shown the yellow card for a bad foul. Lo'eau LaBonta (FC Kansas City) wins a free kick in the defensive half. Hand ball by Katie Stengel (Washington Spirit). Corner, FC Kansas City. Conceded by Stephanie Labbé. Attempt saved. Shea Groom (FC Kansas City) left footed shot from outside the box is saved in the top centre of the goal. Attempt blocked. Francisca Ordega (Washington Spirit) left footed shot from the centre of the box is blocked. Assisted by Meggie Dougherty Howard. Foul by Kristie Mewis (Washington Spirit). Attempt blocked. Shea Groom (FC Kansas City) right footed shot from the right side of the box is blocked. Alexa Newfield (FC Kansas City) hits the bar with a left footed shot from outside the box. Assisted by Desiree Scott. Substitution, Washington Spirit. Francisca Ordega replaces Cheyna Williams. Goal! FC Kansas City 2, Washington Spirit 1. Sydney Leroux (FC Kansas City) right footed shot from the centre of the box to the bottom left corner. Assisted by Shea Groom. Attempt saved. Brittany Ratcliffe (FC Kansas City) right footed shot from outside the box is saved in the bottom left corner. Assisted by Brittany Taylor. Line Jensen (Washington Spirit) wins a free kick in the defensive half. Delay in match Cheyna Williams (Washington Spirit) because of an injury. Alexa Newfield (FC Kansas City) is shown the yellow card for a bad foul. Goal! FC Kansas City 1, Washington Spirit 1. Sydney Leroux (FC Kansas City) left footed shot from the centre of the box to the bottom right corner. Assisted by Brittany Ratcliffe. Offside, Washington Spirit. Whitney Church tries a through ball, but Katie Stengel is caught offside. Goal! FC Kansas City 0, Washington Spirit 1. Kristie Mewis (Washington Spirit) left footed shot from the right side of the box to the centre of the goal following a corner. Corner, Washington Spirit. Conceded by Brittany Ratcliffe. Attempt blocked. Meggie Dougherty Howard (Washington Spirit) right footed shot from outside the box is blocked. Assisted by Line Jensen with a headed pass. Corner, Washington Spirit. Conceded by Brittany Taylor.